Honed and tumbled stone wall tiles made of natural marble and travertine. Marble, travertine & limestone wall tiles, mosaics, pebbles & borders. A superb collection of high quality stone pebbles and stone wall cladding tile that are supplied pre-set onto mesh sheets allowing for quick and easy installation. 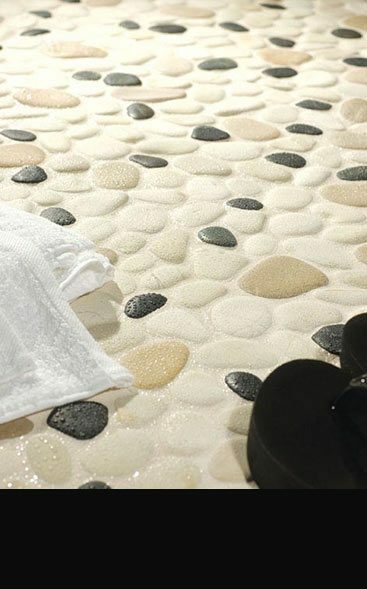 Our pebble tiles are suitable for walls as well as a flooring. Within our Collection our stone pebble we supply cream pebbles, white pebbles, grey pebbles and multicoloured pebble tiles and our stone wall cladding is available in the stone colours of cream, black and grey. The best quality European manufactured glass wall bricks and glass blocks available in clear and coloured glass colours of aqua green, aqua blue, smoke black, tinted black and tinted brown. We also supply all the sundry materials required to easily and safely build a glass wall with the blocks.